Glucose Syrup (Wheat or Corn), Cane Sugar, Thickener (Dextrin Roasted Starch, Acid treated Starch or Starch acetate) (Wheat), Gelatine, Food Acid (Citric), Humectant (Glycerine), Flavours, Colours (Carminic Acid, Black Carrot, Paprika Oleoresin, Copper Chlorophylin, Turmeric, Vegetable Carbon). My daughter really enjoyed a little taste of Aussie last year and was almost in tears re the Honey Log!! So I am sending another this year for her to enjoy. She misses the Mint Slice biscuits, Cherry Ripes and Honey Logs of her childhood!! 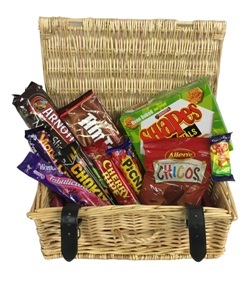 This basket is great value for money and makes a great gift for the home sick, I have asked all my friends to visit this site for Christmas presents.